Located on scenic Hwy 30-A, Mistral 24 is a two bedroom plus bunks, two bath condominium in Seacrest Beach. It sleeps up to eight and is perfect for your family vacation. Wake up to bright sunshine and crashing waves and enjoy your morning coffee on the balcony directly overlooking the sugar white sands of the Emerald Coast. Build a sand castle, fly a kite or rent bikes and enjoy the miles of paths that start and stop at your door. On the top floor of a small community, the panoramic views are absolutely breath taking. Recently updated in 2016, it is very clean and new. The main floor holds a queen bedroom, built-in hallway bunks, a full bath with washer and dryer, kitchen, living and dining areas and Gulf-front balcony. Wind your way up the spiral staircase to the king bedroom loft with clerestory windows and a private bath with a gorgeous tile walk in shower with two shower heads. This Beaches of South Walton location is convenient to Rosemary Beach and Seaside boutiques and restaurants, while being in a less crowded, family friendly area. Email or call today to reserve your dates! Highway 30A is a 20-mile scenic shore tucked quietly between Destin and Panama City Beach, Florida. Speckled with artsy villages, rare coastal dune lakes, upscale resorts, funky beach bars, world-class restaurants and 25,000 acres of protected habitats, Florida's Scenic Highway 30A is the birthplace of 'New Urbanism' and is also home to the most beautiful beaches in the world. You will find yourself returning to Mistral 24 year after year. See our 1 bedroom listing VRBO 508039. PETS: We're sorry. We do not allow any pets. Please do not email to ask for an exception. Pets are never permitted. AGE RESTRICTION: No reservations will be made for vacationing students or any singles under 25 years of age unless accompanied by an adult legal guardian or parent during the entire stay. Restrictions may apply regarding the number of people that may accompany a parent or legal guardian. Chaperoned groups are prohibited. Please do not email and ask for an exception. SMOKING: Smoking is NEVER permitted in the unit or on its balconies or porches. We are a military family. I am retired from the Air Force and my husband is in the Army. We have twin sons. We love to travel--especially to the beach. One of our favorite places is Hwy 30-A. Hwy 30-A is the best place for a family vacation. The beaches are quiet and clean. It is close to Panama City Beach, but seems a world away. We bought this condo to enjoy as a family and hope to live there full time when we retire from the military. Until then--we hope you will stay and enjoy it as much as we do. Unobstructed 180 degree views. Directly on the sugar white sand beaches of the Emerald coast and scenic 30-A. Bedroom, bathroom and kitchen linens provided. Bring your own beach towels. 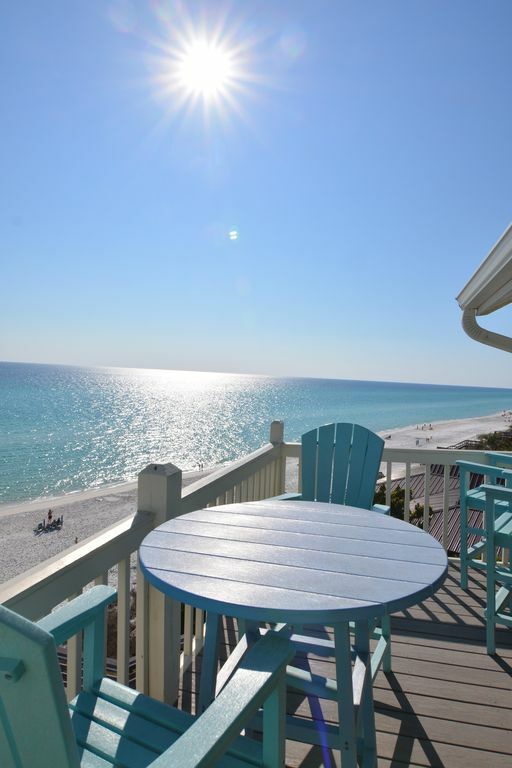 Beautiful balcony directly overlooking the sugar white sands of the Emerald coast. Table and four chairs. Gulf front balcony with table and 4 chairs. Perfect for coffee in the morning or a glass of wine to watch the sunsets. Interior was clean and nicely furnished. Beautiful beachfront. Wonderful unobstructed view. Very close to both Rosemary, Alys and Seaside. Easy no hassle parking. Kitchen had everything we needed. Thanks Nick. We enjoyed having you. I'm glad you enjoyed the views. We thoroughly enjoyed our stay for the week! The view was phenomenal and the beach was quiet. We were also within walking distance of Alys Beach and some great restaurants. We only used the upstairs bed and it was VERY comfortable. I thought we may have trouble with the uncovered upstairs windows preventing our sleep, but they weren't a problem at all. We definitely got a good workout on the stairs but that would only cause a potential problem for people with orthopedic issues. My only suggestion to make this condo even better would be to supply an umbrella for the table on the deck as it gets full sun without any shade at all after 9 am. Angela was the perfect owner and gave us some great suggestions for meals and bike rentals. Thank you for a great week! Thank you for spending your vacation at Mistral 24. We loved having you. My Wife and I truly enjoyed our stay. The left bedroom and bathroom added a lot of charm. The view of the beach and sunsets were icing on the cake. Our family of 4 stayed during a week in July and truly enjoyed our relaxing trip back to 30A. The location and ocean view from this corner condo absolutely can't be beat. We loved that the beach was much less crowded than other areas too. Our boys loved the bunk beds and the master bed/bath was fabulous! Angela was very accommodating and provided a ton of wonderful information upon rental. We had a great week! My family of four had a great week. Everything we wanted to do was close to the condo. We loved waking up and hearing the waves from our room. We walked down the stairs to the beach everyday. A good selection for lunch and dinner was within 20 minutes from condo. This location was a less crowded part of 30A during our stay. Our advice would be to rent the beach chairs and umbrella to get a better spot on the beach front. Overall, we had a great vacation. I could listen to those waves forever. They are so soothing. Thanks for choosing to stay with us and we hope to have you back soon. Great views of the gulf; nicely appointed condo. We really enjoyed our stay in Mistral #24. The owner Angela was very welcoming and attentive up until and throughout our stay. The condo was nicely decorated and had all the amenities we needed for our stay, including kitchen amenities. The king size bed in the loft was super comfy and that shower, amazing! We loved waking every morning and having coffee on the deck overlooking the ocean. With no obstructions, this was the absolute best view of the Gulf. Thank you so much for sharing your place with us, Angela. We had a great time! So happy you enjoyed your stay. I agree, Mistral 24 has the absolute most gorgeous view of the Gulf. Highway 30A is a 20-mile scenic shore tucked quietly between Destin and Panama City Beach, Florida. Speckled with artsy villages, rare coastal dune lakes, upscale resorts, funky beach bars, world-class restaurants and 25,000 acres of protected habitats, Florida's Scenic Highway 30A is the birthplace of 'New Urbanism' and is also home to the most beautiful beaches in the world.